If you are a Xiaomi Mi Note 2 user and want to root Mi Note 2 and Install TWRP recovery, then you are at the right place. Here we will show you how to get the root access on Mi Note 3 phone and install the Custom TWRP recovery. Once the phone is rooted, you can easily take the full system backup and install lots of custom ROMS. 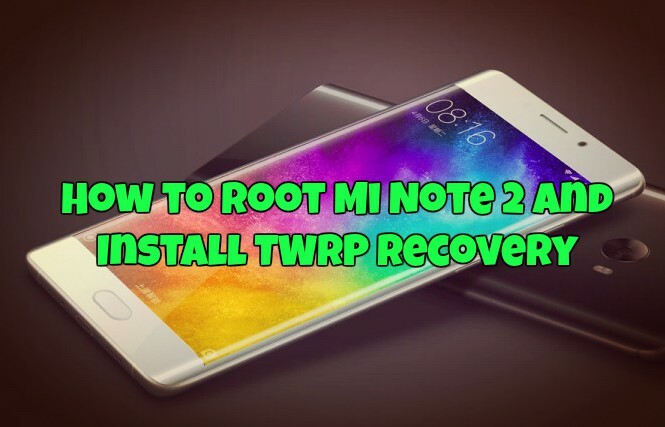 To get the root access on the phone first you need to Install the TWRP recovery and after that, you need to flash the Super Su zip to root the new Xiaomi Mi Note 2 android phone. To get started first, you need to unlock the Bootloader of your phone with the help of official Mi Unlock tool. And this unlocking process will erase all your data from the phone, so make sue to take the full backup of your phone. Read all the steps very carefully otherwise, you may brick your device. We are not responsible for any damage to your phone. This guide is only for the Mi Note 2 Users and don’t apply this method on any other Xiaomi Phones. So let’s get started and Install TWRP Recovery and Root Mi Note 2. Download TWRP Recovery for Mi Note 2 and unzip the folder on your desktop. 1. First, you have to enable USB debugging mode. To enable Developer Options, go to About phone and tap the Build Number 7 times. And enable USB debugging. 6. Now this will install the recovery on your phone. After that type below command to boot into recovery. 7. Now your Mi Note 2 will boot on the TWRP recovery mode. From the first screen of the recovery select your preferred Language and set it to what you want, tap “Never show this screen on boot again”, and Swipe allow modification. 8. Now from here go to “Wipe” section and tap “Format Data”, and type “yes”. 9. Now transfer the SuperSu zip to your device over MTP. 10. After that Select the Install Option and locate the Super SU zip file and Swipe to install SuperSu and reboot your device. That’s it. Now your Mi Note 2 is rooted with TWRP Custom Recovery. If you have any questions, then comment below.